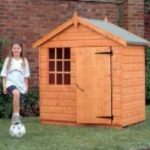 All our playhouses are delivered flat packed with ready built side walls, floor panels and roof panels. 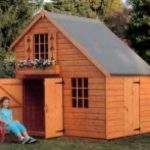 The floor and roof sections are constructed from timber not sheet material. The felt for the roof comes ready cut to size and our sheds are supplied with glass for the windows. All fixings and instructions are supplied on delivery. Designed for the smaller garden where space is at a premium the floor size being 5′ wide x 3′ deep. 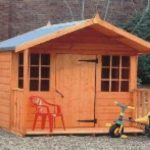 Fitting a veranda as an optional extra adds an extra 2′ playing area. 2 storey detatched, with double garage doors and a single side door. Shown here with optional extra window box and decorative shutters. 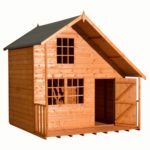 An impressive 2 storey detatched playhouse, available in 2 size variations. Shown here with optional extra veranda and window boxes and chimney stack. Authentic 2 storey mansion with built in veranda as standard and split level upper floor. Shown with optional chimney and extra window boxes, and shaped barge boards. Size: 8’x8′ model available. 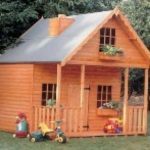 Detatched 2 storey playhouse with rural look. This model comes as standard with one upper window and 2 lower windows in the left hand 6′ gable. Available with extra mock dormer windows and window boxes as shown. Size: 8’x6′ model available.